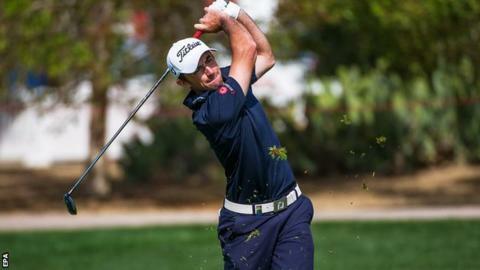 World number 357 Gary Stal claimed his first European Tour title following an astonishing collapse by Martin Kaymer at the Abu Dhabi Golf Championship. US Open champion Kaymer began six shots ahead and that soon extended to 10. But after 47 holes without a dropped shot - a bogey then double and triple bogeys saw his lead gone by the 13th. Germany's Kaymer shot 75 and was third as 22-year-old Frenchman Stal carded a 65 to reach 19 under and win by one, with Rory McIlroy second after a 66. Stal, who tied for fifth at last week's South African Open, was eight shots behind going into the final round, but birdied six of his first 11 holes. After securing victory he said: "When I saw my name on the leaderboard I thought it was possible." An emotional Stal revealed his thoughts after winning turned to his late mother Christine, who died last May while he was playing the BMW PGA Championship in Wentworth. "I thought about all the people that were looking at me, I thought about my mother, I thought about her a lot," he told reporters. Two-time major winner Kaymer, who won the US Open by eight shots at Pinehurst last year, had seemed certain to record his fourth Abu Dhabi title after adding three birdies in his first four holes. But there were to be no more for the world number 12 who found continuous sand trouble, with a double bogey on the ninth and again at the 13th where he also duffed a chip. "I'm surprised and a little shocked. I don't really know how to put it into words," he said. "I didn't hit many fairways, that was the problem, and I didn't make many putts either. "On the other hand I was playing really good golf and that is what you can build on and what is most important for me." McIlroy, who took 34 putts in round three and began the final day eight behind Kaymer, revived his hopes with three consecutive birdies from the eighth and added more at the 13th and 15th. In a greenside bunker at the last he needed to hole for an eagle to reach 19 under, but his delicate escape shaved the cup and stayed up, resulting in his fourth runner-up finish at the event. "Once I started getting my caddie JP to read my putts it was a lot better," he said. "It was nice to finally get it going but that little stretch yesterday and early today cost me the tournament." Welshman Jamie Donaldson carded three successive birdies in a 70 and shared eighth place six shots behind champion Stal.